As we begin this new school year I would like to take a minute to talk to you about the importance of digital citizenship. As citizens of a town/state/country there are rules that must be followed. For example, stopping at stop signs or paying taxes. The same is true when using the internet. Digital citizenship is very important and abiding by rules when using the internet not only helps protect you and keep you safe but it also protects others. Some topics digital citizenship covers are netiquette, internet safety, cyberbullying, and copyright laws. Take some time to explore this site to learn all that you can about digital citizenship! To begin watch this short video. [Grom Social]. (2015, October 17). Digital Citizenship and You! [Video File]. Retrieved from https://www.youtube.com/watch?v=2VnAU2lbf2c. Netiquette can be simply defined as the manners you use while on the internet. You leave a digital footprint where ever you go on the internet. Any email you send, Facebook post you make, or Tweet you send is stored in digital archives forever even if you delete it from your personal account. This is why it is very important to make responsible decisions while using the internet and technology. Netiquette should be exercised especially when communicating via email or social media outlets. You should always be polite and respectful of others as well as yourself. You should never ask for someones personal information or provide them with yours. This would include any information that could be used to identify who you are such as your address, age, telephone number, social security number, etc. If you ask someone for this information you are invading their privacy and if someone asks you for this information they are invading yours. You must be especially careful of giving someone your personal information when social networking. You must also be careful not to become a cyberbully. You must always consider how your comments will make someone else feel and you should always choose your words carefully. At Sunny Side City Schools we have policies for both social networking and cyber bullying you can review them below. Sunny Side City School District has a strict no tolerance policy for cyber bully. Any student found to be involved in such behavior will be dealt with according to the policies outlined in the school district's handbook. 1. Only share and send information through your school issued email address. 2. Do not use social media or the internet to hurt, harass, attach, or harm another person. 3. Do not violate copyright laws. 4. Do not ask for or share any personal information while on the internet. 5. Do not view, post, or send anything that contains any obscene, profane, vulgar, rude, or threatening messages or images. 6. Do not share your usernames or passwords with anyone. 7. Do not participate in any illegal activities. 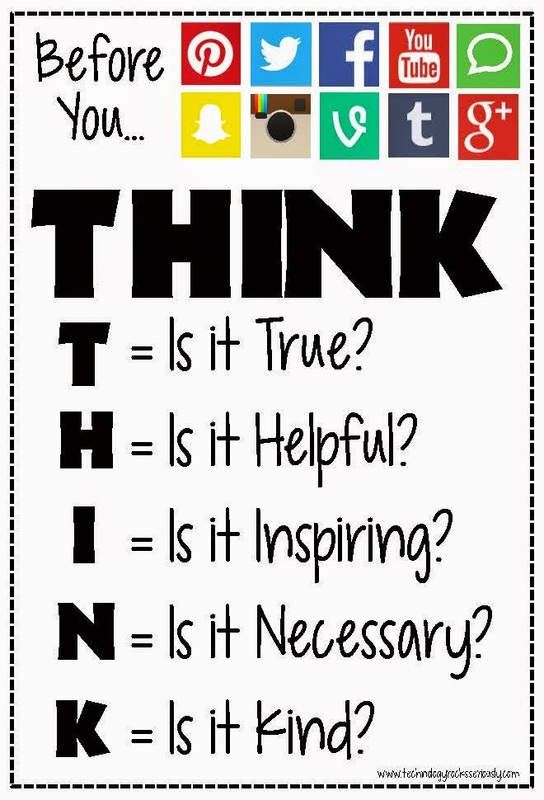 When trying to decide if what you are about to post, share or send is appropriate THINK before you do. Long, S. Retrieved from technologyrocksseriously.com.